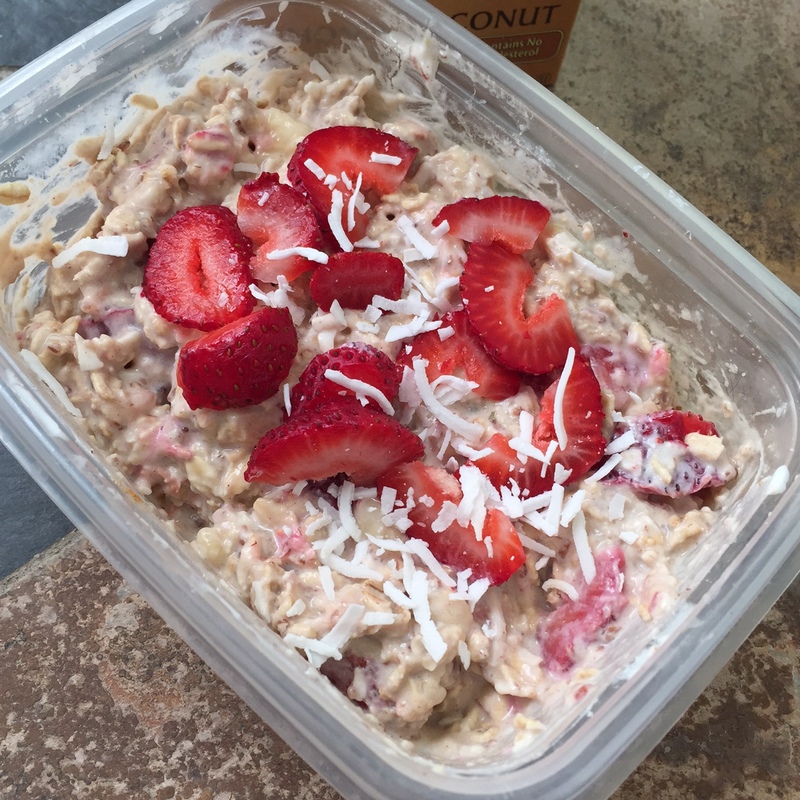 So now that I have introduced you all to the wonderful invention that is overnight oats…here is another delicious recipe! As much as I love the peanut butter, chocolate, and banana oats, I do occasionally try to switch things up. I had just bought some fresh strawberries, so I decided to mix those with a banana and then add a tropical coconut twist. Almond Breeze’s Almond Coconut Milk was the perfect addition! Everyone knows my obsession with coconut, so when I first saw this milk at the store I had to try it. It’s like drinking a delicious coconut beverage, minus the beach (although I wish there was a beach involved). It’s delicious on its own but it also made these oats so yummy! I added shredded coconut as well, because you can’t have too much coconut, and I gobbled it right up. I also added some ground flax seed for a nice boost of heart-healthy omega-3 fatty acids and fiber. 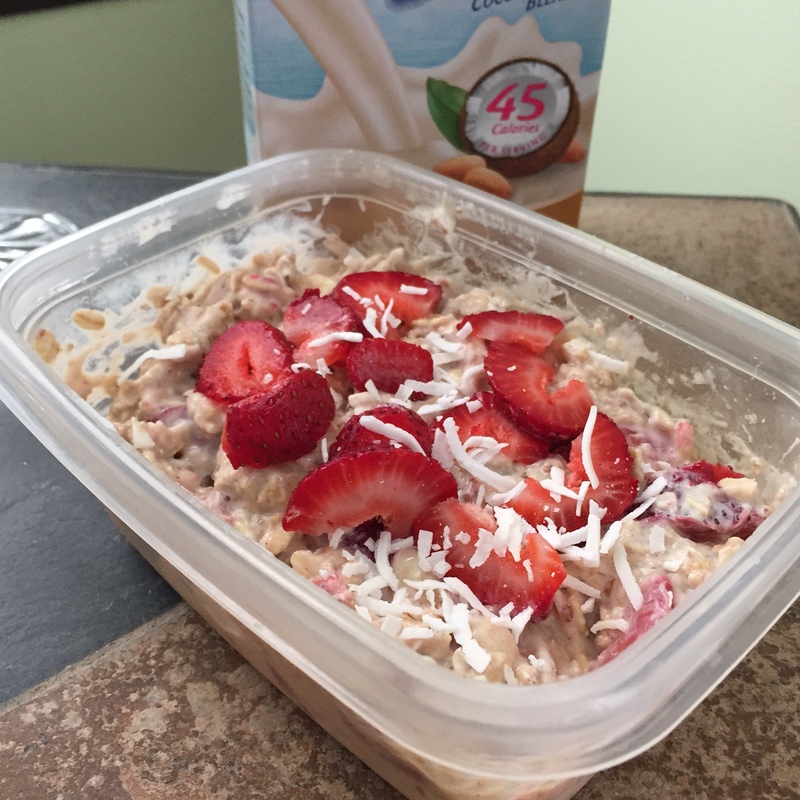 Quick, easy, delicious, and it kept me full all morning – the perfect breakfast! 2.) In the morning, uncover the bowl, grab a spoon, and enjoy!